House of Woyaks: GO PACK GO! WOOT! 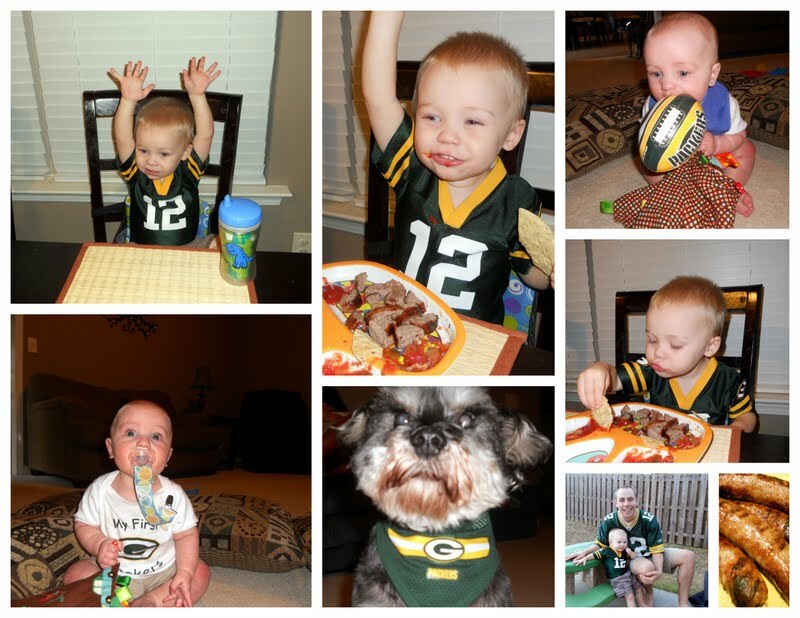 Here are some fun pics from the first Packer game of the season at the House :) GO PACK GO! 2. Alex is checking it all out. 3. Andy way "WOOOOOO!" when they show the stadium. He's so ready -can you tell? 4. Max sporting the green and gold. 6. Again, Andy saying "woooo" as he digs in to dinner. AWESOME! GO PACK GO! I need to do some pictures next game! But we need to buy some new Packer gear too! Thanks!! Andrew's jersey is starting to get too small and Alex's is growing so fast that I don't know how much of Andy's outfits he will be able to wear. How big is your little guy?? I am a Ravens fan...but Packers come in second (we have family in Wisconsin) ! Too funny! I have family in MD. My mom is a Ravens fan!